"These pins are the creme de la creme. They offer the best choice for achievement awards, or a Grand Opening or Gala event." 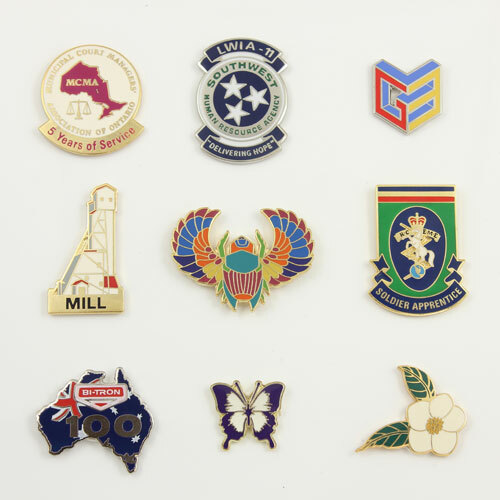 Discover why International Coats of Arms Cloisonné Pins are the best choice for many people. 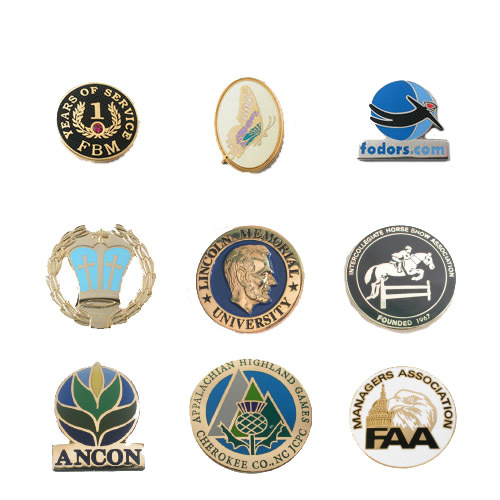 If you want your logo and text to stand out from the pin you may want to consider a cloisonné lapel pin. The polished metal will make your pin come alive with sharp contrast between the colors. International Coats of Arms offers synthetic stone for effect: Diamond, Emerald, Ruby, Sapphire, Amethyst and optional Laser Printing allows for sharp detail without the gold/silver borders between colors. A Cloisonné Lapel Pin is the pinnacle of traditional Chinese handicraft. It is a process that is steeped with tradition dating back to the Yuan Dynasty (1271-1368). A constantly evolving process, many believe that the best Cloisonné was made during the Xuande period (1426-1456) of the Ming dynasty. Later, during the Jingtai period (1426-1456) of the Ming, artisans perfected the dark-blue enamel that gives Cloisonné the beautifully unique appearance that has been cherished for centuries. Still later during the Qianlong period (1736-1795) of the Qing Dynasty, copper was introduced for the rough casts. This newer process proved to be yet another milestone for the artisans. Cloisonné pins are the jewelry line of lapel pins. And with the extensive labor to produce each pin, the pricing is appropriately the highest of all pins sold. Does your event or presentation require this high quality? Call at for suggestions. The Cloisonné process requires a 'color fill' and as such, designs must have an exact outline to receive the enamel color. Why? It helps to think of a design from say, a child's coloring book. Each color must be colored 'within the lines'. Bolder designs are better. Sans serif fonts for lettering or wording are best. How Are Cloisonné Pins Made? Referring to the customer's design, a copper die is created to imprint your design into the metal complete with 'Cloisonné' that will eventually be used to hold the color. A cutting mould is then created to provide an exact outline for the pin design. If a center hole or cut-out is required, an additional cut-through mould is created. Enamel that is composed of a glass like material combined with metal oxides is mixed into a fine clay like powder. This enamel will faithfully reproduce the customer's selected colors. Colors are then hand-filled with this unique mixed enamel using small spatula-like instrument. Each color must be fired at 1,600 F for 2-4 minutes before the next color is added. And so the process continues for each of the customer's requested colors: hand-filling, firing, cooling. While this two step process may seem laborious, this in the only way to ensure that the colors do not 'bleed'. Next each piece is finally cooled again. The polishing and stoning process begins. A carborundum stone is used to rub any excess enamel color. The pin is now polished and shiny. The attachment (typically a military clutch) or finding must then be attached to the back of the pin. The plating process begins. Usually an 18kt gold plating is applied, but depending on the customer's wishes, 24kt gold, silver, brushed nickel, antique gold, silver or brass and many other plating options are available. Each item is then inspected - not all make the high quality standards. Those pins that meet these highest standards are then individually packed and sent to us. All pins that arrive in our office receive a final inspection from our support staff. Only those that meet our standards are shipped to you, the customer.